As files are deleted over time, the space within your access database file can become fragmented. This will result in your database growing to a much larger file size than it needs to be. Regularly compacting your MS Access Database is a great way to improve the performance of your database and reduce the file size. **Important** Make sure no other users are currently accessing the database! You can compact the database you currently have open by clicking File > Compact & Repair Database on the info tab in Backstage view. You can tell MS Access to compact the database each time you close it. 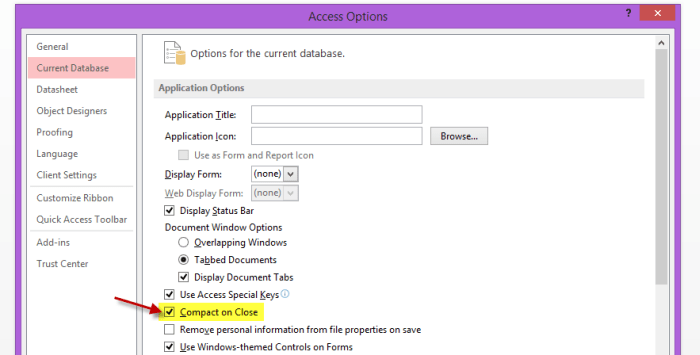 Open your database > Click the FILE tab > Click OPTIONS > Select the Current Database category > Select the Compact On Close checkbox under Application Options. Note: If multiple users are sharing the same database, Access compacts the database when the last user closes it.